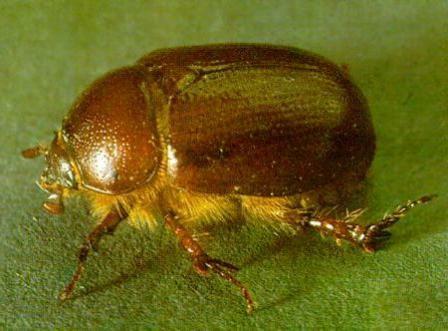 Region: With exception to the Deep South area, this beetle can be found throughout North America. Life cycle: This Beetle only produces one generation each year and hibernates as an adult in the soil. Physical Description: This beetle appears reddish brown or black in color and has a hard shell with small holes forming lines on its back. Its size is about 1/2 inch long. The eggs are white and are laid in early spring in the soil. The larva is bluish white with a brown head and with a curved shape of about 1 inch long. Feeding characteristics: As larvae, the beetle chews the roots of a variety of grain crops. As adults, they feel on the stems and toot of host plant, but they seldom do any damage.